Regularly syncing the iPhone with iTunes not only updates the device with music, photos and other multimedia stored on your computer, but also backs up data stored on the iPhone onto the computer. Your iPhone notes suddenly disappeared or lost? Don’t worry. Whatever the reason, if you’ve synced iPhone with iTunes before, you still have the chance to get notes from iPhone backup. 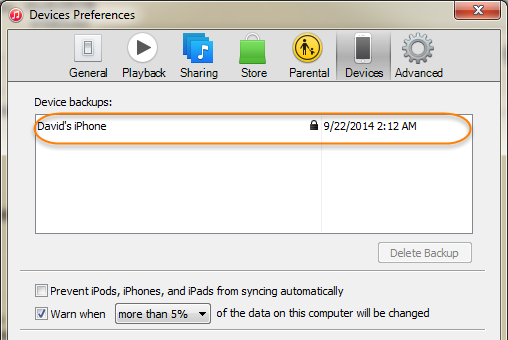 1)Don’t sync your iPhone with iTunes after notes disappeared or lost. Or the iTunes backup file will be updated and you lose the chance to retrieve notes from iPhone Backup. 2)Make sure you have a recent iTunes backup available. To check when your iPhone’s last backup was, just go to iTunes > Edit > Preferences > Devices, and you’ll see a list of the available iTunes backups and the data when they were created. Now that you have located a suitable backup, you can recover notes from iPhone backup. Please acknowledge that it’s not recommended to restore iPhone from backup via iTunes, which will overwrite data currently existing on your iPhone with the contents in the backup. This means you will lost photos, videos, contacts, messages and more created after the backup was generated. To avoid the risk of data overwriting, you’d better use a third-party tool – Free iPhone Backup Extractor. 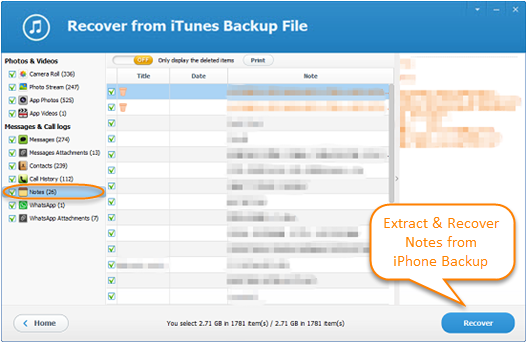 It is a free tool dedicated to extract notes from iTunes backup created for iPhone 6, 6 Plus, 6S, 6S Plus, SE, iPad Pro, iPad mini 4/3, iPad Air 3/2, etc. Besides, you are able to preview the notes and recover the ones you want. The program can also extract and recover contacts, messages, photos, videos from iPhone backup. 1.Download and install the free iPhone Backup Extractor on your computer and then run the software. 2.You will see all iTunes backups located on your computer. Select the one that contains your lost notes and tap “Next”. 3.Now you can select Notes from the listed file types, then click on “Next” to access notes from iPhone backup. If you have no backup file or the backup file is too old, what should you do? Take it easy. iPhone Data Recovery can help you retrieve notes by directly scanning your iPhone. Give it a try!